Having made the switch from Sub Pop to Columbia, Band of Horses continue to creep into the peripheries of the mainstream with this new album. 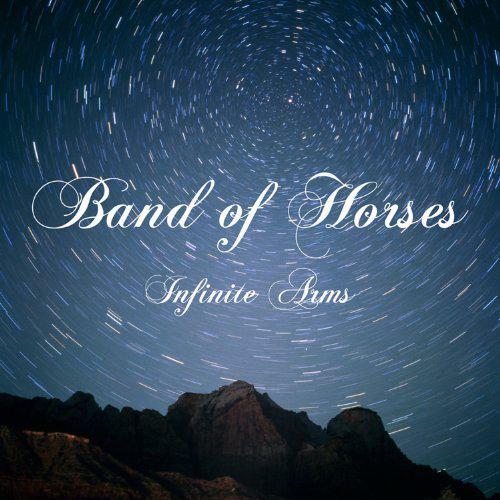 With their dusty, widescreen Americana, Band of Horses could well be 2010's Kings of Leon. The songs on Infinite Arms certainly have ample ability to reach a mass audience in the same way KoL's Only by the Night did in 2008, but perhaps a more apt reference point would be another well-established band who also broke through to greater success that year. There's a world-weary yet tender-hearted sentiment to songs such as opener 'Factory', on which Ben Bridwell sings "I think it's finally time for me to laugh about it" over lush swelling strings, that immediately puts one in mind of Elbow. Like Elbow's The Seldom Seen Kid, Infinite Arms is full of slow burning tracks with subtle but persuasive hooks which sink into the listener's mind and then explode after a few plays. What this record also has is a series of breezy, melancholic, but fairly bland guitar-pop tunes like 'Laredo' 'Dilly' and 'Older', everyone of which comes with 'cross-over hit' written all over it. Beyond this, there's the subtle charms of the title track, 'On My Way Back Home' and 'Evening Kitchen'; songs which recall the folky REM of Green mixed with Beach Boys vocal harmonies. Expect these tracks to be all over TV docu-dramas like a bittersweet rash in a few months' time.